In November 2011, I was asked to work with the children from Room 7 at Harewood Primary School to create a feature garden sculpture that reflected the children and their relationship with the school. Their teacher explained that they had all helped to raise money and it was going to be a very special project that they were all looking forward to be part of. I loved the idea, it was something different to my stone carving workshops that I had done with small groups in the past. We discussed the details about the project and then I was introduced to the children to talk about the designs that they had sketched and what they envisioned for the school. I spent an afternoon teaching them how to go about creating a design for a sculpture. They learnt about weakness in the stone and where to have the best weight distribution as well as creating a sculpture from a solid base. I was also able to share with them some of my other art works, talk to them about what inspires me and my profession as a sculptor. Within a few days the final design was drawn and the stone was ordered and delivered to the school ready for carving. The children learnt about the safety aspects of stone sculpting from working with the tools to knowing that they needed to wear the safety goggles at all times through the carving process. Working in groups of two to three children at a time, they then started to cut away excess stone as they worked into the design. Some of them had never used saws or chisels before, so it was exciting for them to try it for the first time. Most of the time they worked on the sculpture for one or two afternoons a week. 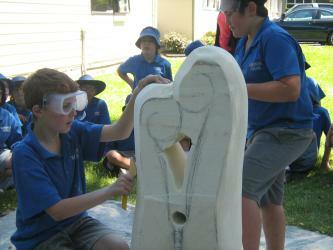 It didn't take long for the sculpture to take shape and before long it was the buzz of the school. Frequently teachers from other classrooms would bring their students to come see how progress was going. After some time, the children from room 7 took to answering all of the questions themselves , and how they managed to carve and shape it. They talked about the meaning of the three Koru. The largest one being the guardian or parent, The second koru representing the teacher and the small koru at the front represents all of the children who attend Harewood School. They also acknowledged the koru design as being symbolic to the Maori and how it has become part of New Zealand culture. Towards the end of the project they were extremely proud of what they had achieved and were pleased that they had learnt new skills in the art of stone sculpting.